4 Cobia Boats Center Console, This beautiful 2014 Cobia 256CC with just 140 hours is very well equipped for the serious fisherman. Boat includes: Factory Powder Coated T-top with Rocket Launchers including Kingfish Rod holders and Led Spreader Lights this boat has a total of 31 Rod holders , Porta-Potti with Port Window , Lenco Trim Tabs, Hydraulic tilt steering, Raw and Fresh Water Wash-down , Fish Boxes with Macerator , 3 Batteries & Wiring for additional Battery , Live-wells W/ Pumps, Automatic Bilge Pumps, Helm Seat with Tackle Station, Clarion Cmd8 Stereo w/ P4 Premium Speakers, Two Garmin 741xs Garmin Gxm-52 and Garmin Thru-Hull Chirp Tilted Element 600w Transducer, Icom M422 Vhf Radio, Nmea 2 Gateway/CI Plus and Nmea 2000 Starter Kit, 4 ft Shakespeare Antenna Vhf.....Only NON-Ethanol fuel has been used in the motors, they have just had their 100 hour full service. The boat has always been stored in an in-door storage facility. 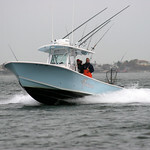 List your boat on Skimmeroutdoors and target serious fisherman from the metropolitan area. No limit to the number of images and you can post, and even post a video as well. For one flat fee of $25, run your listing until sold!